Rosa Salazar is more than believable as the innocent, wide-eyed (literally and figuratively) cyborg who eventually discovers she is a fierce warrior. When James Cameron (Avatar; Titanic) read Yukito Kishiro's Manga, Gunnm, twenty years ago he knew he wanted to make it into a major motion picture with himself directing. However, his other projects derailed his desire and, after having penned the screenplay, Cameron handed over the work to protégé, Robert Rodriguez (Sin City) who began principal photography in October in 2016. A year and a half later, Alita: Battle Angel will open in theaters this Valentine's day. Starring Rosa Salazar (Maze Runner: The Scorch Trials), the film will introduce audiences to the world of Japanese Cyberpunk. The year is 2563, three hundred years after "The Fall". There is one "sky City" left but Dr. Dyson Ido (Christoph Waltz; Inglorious Basterds) lives on earth, which is overcrowded and far from stable. Scavenging through the garbage dump Ido, a "cybersurgeon" finds the still functional head and chest of a cyborg. He brings her back to his clinic and fits her with a mechanical body and names her Alita. When she awakens she has amnesia but over time learns she knows the ancient art of Panzer Kunts and has flashbacks of a great battle. Wanting to know more she becomes intrigued with the game, Motor Ball. 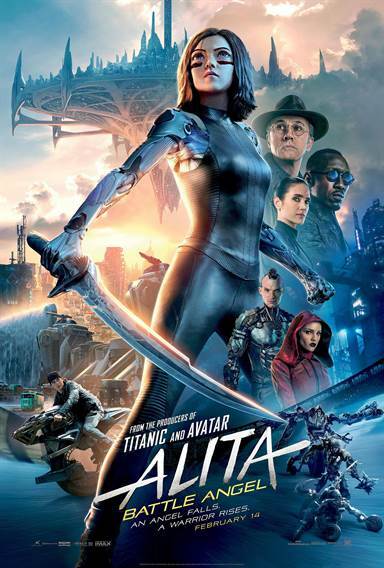 Alita learns that the only way to go to the sky city is to become the ultimate champion of Motor Ball – an extremely dangerous sport that is a cross between extreme roller derby, Mixed Martial Arts, Nascar, Quidditch, etc. Determined to win Alita enlists Ido's reluctant help, as he used to create Motor Ball Champions until the day one of his creations went awry, killing his daughter. As Alita works as a Hunter-Warrior (Bounty Hunter), which is the Sky City's way of keeping law and order on the ground, she remembers more and more about her past. With Dr. Ido's help, she learns she was once the enemy hunting Nova, the ruler of the Sky City. More determined than ever, she vows to find a way to the sky city. Salazar is more than believable as the innocent, wide-eyed (literally and figuratively) cyborg who eventually discovers she is a fierce warrior. Her performance makes Alita as human as anyone and the audience can't help but be drawn to her, Waltz is excellent as the surrogate father figure Alita needs, even as she rebels against him. Alita's love interest, Hugo is played by Keean Johnson (Nashville) and Nova's lackey is masterfully portrayed by Oscar winner Mahershala Ali (Green Book). This ensemble, including Jennifer Connelly (Only the Brave) and Ed Skrein (Deadpool), bring this futuristic story to life in the best way possible. Cameron's script is the one downfall of Alita: Battle Angel. It becomes apparent early on in the film that there are tons of details being crammed into two hours which can make for a muddled mess at times. Cameron, known for his epically long films, obviously envisioned Alita: Battle Angel being longer in duration and condensing it led to confusion at points. It also left me wondering about what I thought was probably critical information, such as who is Nova, why does he control Sky City (and the ground dwellers by extension) and why does Alita want to kill him? Obviously, Cameron is counting on a sequel to clear up those details. With amazing set designs, an excellent cast, and a solid story, the film is stronger than I expected and I think most people will be pleasantly surprised. Rodriguez also did a great giving the audience wonderful visuals while bringing out nuanced performance from the cast. If you like the Science Fiction genre then you won't be disappointed by this graphic novel adaptation of what is ultimately a classic story at heart. For more information about Alita: Battle Angel visit the FlickDirect Movie Database.